Greek power metal band FIREWIND is a true conglomeration of in-demand players. Main man and workaholic guitarist Gus G. just released and toured behind his third solo album, I Am The Fire, while Ozzy takes a break after completing BLACK SABBATH’s farewell tour. Gus has continued to stay busy as usual. Keyboardist/Guitarist Bob Katsionis is involved with too many bands to mention, but recently he released SERIOUS BLACK’s excellent Mirrorworld album. You can read a review for that album HERE. Drummer Johan Nunez has played with his band MERIDIAN DAWN and GUS G’s solo material. New vocalist Henning Basse (ex-METALIUM and SONS OF SEASONS) has recorded with the bands MAYAN and ORPHEUS BLADE in the past few years. Bassist Petros Christo is possibly the most reliable member of FIREWIND, and keeps busy with his restaurant in his hometown of Thessaloniki. As hard as these guys work, they may have neglected FIREWIND for too long; Immortals is the band’s first studio album since 2012’s Few Against Many. Ironic, because vocalist Apollo Papathansio quit the band at the end of 2012 because of the band’s hectic schedule. The revolving lineup of the band (Gus G. is the only constant member) has given us multiple players in every position other than lead guitar. In fact, there have now been five different singers for this band, even more if you count Mats Levens’ live shows in 2011 and Kelly Sundown Carpenter’s stint on tour in 2012-2013. Henning Basse is a world class vocalist who fronted METALIUM and nearly became the vocalist for SAVATAGE at one time. He has toured with FIREWIND before in 2007 (and with Gus G’s solo band as well). So he isn’t completely new to fans, but this is his first studio recording with the band. 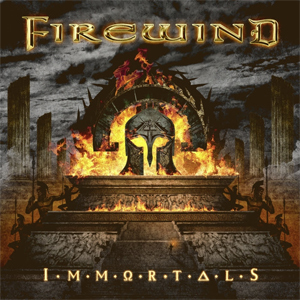 FIREWIND have stated that Immortals is a concept album, focusing on ancient Greek history, particularly the Battle of Thermopylae and Salamis in 480 BC during the second Persian invasion of Greece. Opening track “Hands Of Time” was the first single released from the album back in November. This song wastes no time getting right to the fast-tempo, power metal style FIREWIND are known for. Nunez’s double bass is accented by Katsionis’ keyboard flourishes. Basse’s voice is a bit gruffer than Apollo’s and may take fans a little time to appreciate, but not me. As a METALIUM fan, I know what this guy brings to the table. His ability to hit and hold notes is amazing and make no mistake, FIREWIND is lucky to have him. “We Defy” follows with its in-character message the band are known for. Some nice guitar and keyboard interplay can be found on this track. From here, the album reveals its strongest material with the following songs. Anthem “Ode To Leonidas” (inspired by the story of the 300), features a chilling spoken intro and is a stimulating call to arms. A concept video for the song can be viewed on KNAC.COM right HERE. “Back On The Throne” is a favorite pick for me, featuring a riff reminiscent of Ozzy’s No Rest For The Wicked album. A blistering pace and towering chorus from Basse emphasize this track’s power. “Live And Die By The Sword” is destined to be a concert classic. The build of the song from acoustic guitar and ambient thunder in the background to balls-out rocker is excellent. The shout along chants will involve the crowds for sure. “War Of Ages” is a solid melodic power metal track, featuring a proud lead vocal from Basse and double bass drumming from Nunez. “Lady Of 1000 Sorrows” is the requisite ballad, and you know what? It’s a damn good song, with a memorable chorus and melody. Title track “Immortals” is an instrumental; Gus shreds all over the place on this short track and the song is over before you realize it. “Warriors And Saints” is one of the heaviest songs on the album, which features Basse reaching into his higher register for much of the song. “Rise From The Ashes” is a mid-tempo track featuring another winning chorus. Bonus track “Vision Of Tomorrow” brings the total to 11 songs at around 50 minutes. I find this to be one of FIREWIND’s strongest albums. There really isn’t a bad song on the album, and it stayed in my stereo for a long time. Dennis Ward (PINK CREAM 69) worked with the band to write, produce, engineer, mix and master Immortals. Incredible work; the album sounds amazing and has a definite spark to it! Gustavo Sazes’ fantastic cover artwork is the icing on the cake. FIREWIND have also found a new home on AFM Records, who currently have one of the strongest rosters in all of music. Immortals will be released on January 20, 2017. Pre-order your copy of Immortals in the KNAC.COM More Store right HERE.